Types of Art: To render the hostile forces of the forest material, they sculpted a type of mask that would provoke terror: the gre, with its grimacing face, distorted features, facial protuberances, horned heads, bulging forehead, tubular eyes, and wild animals' teeth. 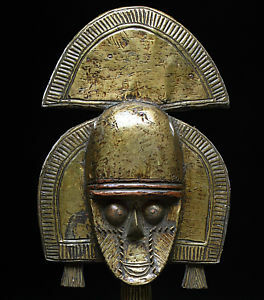 In earlier days, this mask presided over the ceremony held when peace was restored after armed conflicts and it participated in sessions of customary justice. Of We origin, the Bete mask is more elongated and has no fangs, horns, or bullen nails. History: Settled on the left shore of the Sassandra River, the 370,000 Bete of the Ivory Coast are divided into ninety-three groups. Some authors situate one Bete group in Liberia. Traditionally, Liberia was given as their place of origin, but that opinion is now being contested. Economy: They are mainly into agriculture (subsistence farming) they only grow what is needed by the tribe. They live under ancestor authority. They also have links to a small market economy and cultivate cocoa and coffee to generate income. Political Systems: Lacking in centralized power, the Bete were grouped together in relatively major villages, containing several lineages, probably for security reasons. Each lineage had a totemic animal whose meat was taboo. The most senior member of the lineage exercised a moral and judicial power, notably in terms of awarding land. The Bete, who ascribed more importance to the hunt than to agriculture, grew only what was needed for a subsistence economy. Religion: They maintain a harmonious relationship between nature and the ancestors. The vast majorities follow their traditional African religion and believe in the God Lago however; they do not worship this God. They believe in the spirit world to guide and protect them through daily life. These spirits they believe are found in nature, namely rivers, rocks, forests etc. Sacrifices of worldly possessions are made to the spirits to appease them especially during troubling times.